A Master Planned Gated Country Club Community with Lakes, Parks & more! This community engulfs approximately 1,800 acres and over 1,900 homes in 30 unique neighborhoods. This massive master planned and gated community is managed through a network of Associations. 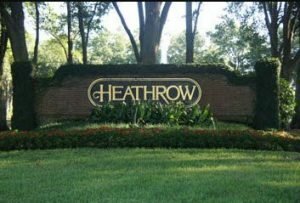 The Heathrow Master Association primarily covers common areas along Heathrow Blvd and Sawyer Lake Park. Then there are a series of 13 Neighborhood Associations that are responsible for their respective subdivisions. Finally, there are Neighborhood Committees and a Town Advisory Council (TAC) that is comprised of neighborhood committee chairs. Each of the 30 neighborhoods is unique, both in architectural style and overall look. Each of the 30 neighborhoods are unique, both in architectural style and overall look. Heathrow neighborhoods are: Brampton Cove, Breckenridge Heights, Bristol Park, Brookhaven Manor & Ridge, Burlington Oaks, Carrington Park, Cherry Ridge, Chestnut Hill, Clubside, Coventry, Devon Green, East Camden, Heron Ridge, The Hamptons, Keenwicke, Kentford Gardens, Lakeside, Lexington Green, Muirfield Village, Racquet Club Villas, Regency Green, Reserve at Heathrow, Stonebridge, Stratford Gardens, Turnberry, Waters Edge, Wembley Park, Westover, Willowbrook and Wyntree. As you can imagine this massive network of neighborhoods offer activities, groups and outdoor fun with something for everyone in the family. For more information visit the Heathrow Community website.